Although on a small scale, the Wendat were, without doubt, trading for European goods long before their first encounter with these unknown people. Coastal peoples had had contact with European fishermen for over a century before the Europeans penetrated to the interior of the continent. Jacques Cartier traded on a small scale with the St. Lawrence Iroquoian on his expeditions in 1535 and 1541. With the establishment of Quebec City in 1608, however, trade gradually increased and the flow of European goods into the interior expanded accordingly. First Nations, of course, traded extensively before the arrival of the Europeans and trade links, routes and customs predated contact. The fur trade or the trade in European goods (depending on one’s point of view), was built on the foundations of the existing trading culture. The Wendat, for example, had close relations with the Nipissing and other northern peoples before the establishment of the fur trade. These ties were simply expanded in response to the increased trade of the 17th century. Such trading relations, in fact, led to the first encounter of Wendat and Europeans in 1609. The Algonkin of the Ottawa Valley and the Montagnais had planned a raid on their enemies, the Mohawk, in the previous year. The Montagnais had invited Champlain to accompany them. In a similar gesture to a trading partner, the Petite Nation chief Iroquet invited his Arendarhonon ally to join. The raid seriously damaged the ability of the Mohawk to harass trade on the St. Lawrence. More importantly, a link had been forged between the Wendat and the French. Wendat tradition held that the founder of a trade route was entitled to maintain a monopoly in any commerce through that route. Ochasteguin, the Arendarhonon chief who had first encountered the French, stood to gain a great deal by this meeting. Through negotiations with other chiefs, however, the principal chief of the Arendarhonon nation, Atironta, usurped Ochasteguin’s rights. Atironta would serve as the spokesperson for the whole Wendat Confederacy. The visit of the young Étienne Brûlé to Wendake in 1609 preceded that of Champlain. Brûlé was sent ahead to learn the language and customs of the native people. The travels of Champlain among the various First Nations became a source of political friction. The Montagnais at Quebec and Tadoussac sought to maintain their primacy in the European trade. Further up the St. Lawrence, the Algonkin fought to seize a similar position for themselves. The Wendat had to plot to secure a visit from Champlain. Each group attempted to prevent the free movement of the French in order to maintain their position in the valued trade in European goods. Champlain toured Wendake in the summer of 1615 and accompanied the Wendat on yet another military expedition against the Iroquois. The Wendat did not permit Champlain to return to Quebec after this expedition but, rather, compelled him to over-winter in Wendake. There were good reasons for this refusal on the part of the Wendat. The activities of Mohawk and Oneida raiders in the Ottawa valley would have made travel dangerous at this time but, more importantly, the Wendat likely needed time to solidify their relations with the French. Champlain’s stay in Wendake secured the position of the Wendat as middlemen in the trade in European goods between the interior and Quebec. Champlain saw in the Wendat a numerous people, well positioned to ensure the flow of furs to his settlements. The Wendat managed to enter a formal alliance with the French, which the Algonkin and Montagnais were unable to prevent. 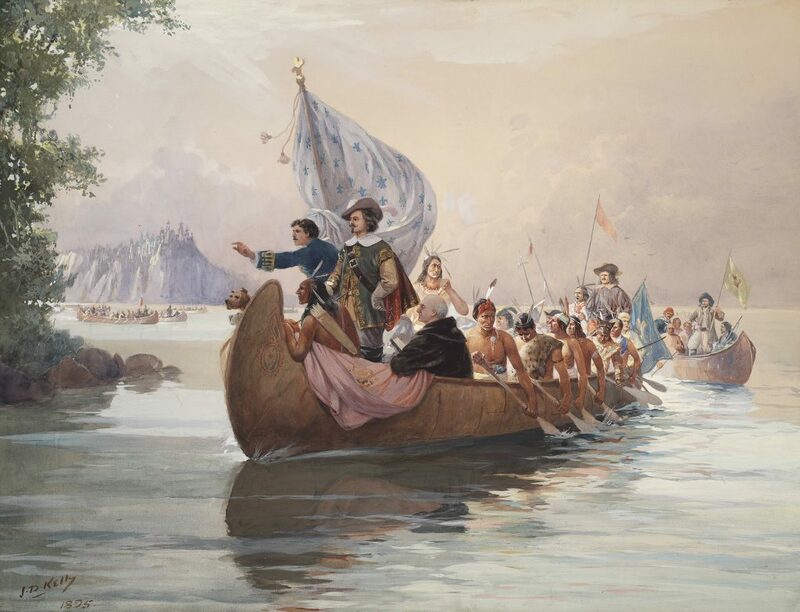 The Algonkin Allumette on the Ottawa River, however, demanded tolls from the Wendat to cross their territory and the relations between the two peoples was always somewhat strained. The year 1611 marked the first journey by the Wendat to the St. Lawrence specifically to trade. Thereafter, the trade grew rapidly. By 1624, approximately 7,500 furs were being moved to Quebec each year. The journey to the St. Lawrence took three to four weeks, travelling from Georgian Bay to the French River, into Lake Nipissing and down the Ottawa River. Trading parties were relatively small, being organised on a village or clan level. Several small groups would start out independently from their respective villages. As Mohawk and Oneida raids increased, the size of the expeditions would grow until 60 canoes would make the journey in company. The inclination of the Wendat to operate on a local basis was overcome by the need for security. The trade went through several changes. From 1622 to 1627 the Wendat enjoyed a period of peace with the Haudenosaunee. During this period, the first missionaries moved to Wendake. Recollet missionaries Joseph Le Caron, Nicolas Viel and Gabriel Sagard returned to Wendake with the Wendat traders in 1623. This event was not unrelated to the bustling trade that had been established between the Wendat and French. The Wendat clearly accepted the strangers into their community, despite their earlier reluctance, to please their new allies. From the French point of view, the priests would encourage more Wendat to trade their goods at Quebec. Le Caron, in particular, was a close associate of Champlain. Despite their sacred mission, the Recollets were far from being a disinterested party when it came to trade. The occupation of Quebec by the English from 1629 to 1632 caused a temporary break in the relations of the French and Wendat. With the return of Quebec to France in 1632 trade continued as before. In the 1640s, the Haudenosaunee mounted massive raids on the St. Lawrence and Ottawa Valleys. The journey to Quebec became even more dangerous than before. Despite travelling in larger groups and other efforts to protect the brigades from attack, losses were inevitable. Between 1642 and 1644 little trade reached the St. Lawrence. It is a measure of how important the trade had become to the Wendat, however, that they continued to risk attack year after year. By 1647, the military threat of the Haudenosaunee in the Ottawa Valley and in Wendake itself became so acute that no traders travelled to the St. Lawrence. Despite this situation, a massive and successful effort was launched in 1648 and a small number of Wendat made the journey in 1649, even as Wendake was being abandoned. The survivors of Wendake continued to play a part in the fur trade but, after 1649, their numbers were never substantial enough for them to take a leading role.